Paul wrote about “having shod your feet with the preparation of the gospel of peace” (Ephesians 6:15). What do shoes have to do with one’s armor? 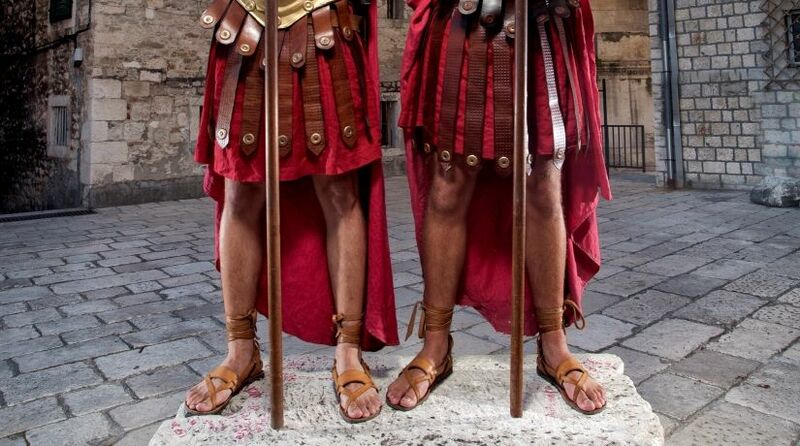 During the time of the apostle Paul, the shoes worn by the soldiers of the Roman Empire were called caligae. They were specifically designed to keep soldiers’ feet healthy during the rigors of long forced marches and were very different from the sandals worn by most of the populace. The shoes were constructed from three layers of leather, which were pulled up and laced around the ankle. The caligae helped protect against blisters and foot diseases. In addition, small spikes or iron hobnails were often driven into the soles of the shoes in order to give firm footing on uneven terrain. A soldier’s shoes formed the foundation of his armament. In those days, the foot soldiers of the empire relied on walking as their primary means of transportation, so the ability to move easily and comfortably was a necessity for them. In addition, they needed to be able to step about in battle without thinking about where they placed their feet. They needed solid footing in order to concentrate on the battle at hand. The Greek Septuagint translation of the Old Testament uses the same word, hetoimasia, to convey the meaning of a firm foundation in Psalm 89:14: “Righteousness and justice are the foundation of Your throne; mercy and truth go before Your face” (emphasis added throughout). Just as righteousness and justice underpin the throne of God, so the gospel message provides the solid footing a Christian must have. The person with that solid footing has a sound foundation for facing the spiritual battles in life. What did He mean when He spoke of the gospel of the Kingdom? The word gospel is translated from the Greek word euangelion, and it means “good news” or “good tidings.” So Jesus came to tell people the good news of a coming Kingdom of God. It was a message that included a call to action: “Now after John was put in prison, Jesus came to Galilee, preaching the gospel of the kingdom of God, and saying, ‘The time is fulfilled, and the kingdom of God is at hand. Repent, and believe in the gospel’” (Mark 1:14-15). The gospel message that Jesus brought was about a coming government of God on earth and what we should be doing to prepare for it! For more information on these subjects, please see the articles on this website titled “What Is the Kingdom of God?” and “What Is Repentance?” The gospel message that Jesus brought was about a coming government of God on earth and what we should be doing to prepare for it! Jesus brought a directive to His disciples, whose feet were to be firmly planted in the gospel: The good news of His coming Kingdom was to be shared and spread. Notice His charge to the original 12 disciples: “Then He called His twelve disciples together and gave them power and authority over all demons, and to cure diseases. He sent them to preach the kingdom of God and to heal the sick” (Luke 9:1-2). The disciples carried out His command! “So they departed and went through the towns, preaching the gospel and healing everywhere” (Luke 9:6). His final command to His disciples contains the same instruction. “And He said to them, ‘Go into all the world and preach the gospel to every creature. He who believes and is baptized will be saved; but he who does not believe will be condemned’” (Mark 16:15-16). In fact, the feet of those disciples, who were delivering that message of peace, are figuratively described as beautiful: “And how shall they preach unless they are sent? As it is written: ‘How beautiful are the feet of those who preach the gospel of peace, who bring glad tidings of good things!’” (Romans 10:15). In our world, we have come to think of peace as a time when there are no active wars being waged. The world that will exist when the Kingdom of God has been established will be a world where the instruments of war will be destroyed and real peace will exist! What better news could there be? A solid belief and grounding in the gospel of peace brings hope to a Christian’s life. That hope should keep us unmoved and pointed toward our goal: “And you, who once were alienated and enemies in your mind by wicked works, yet now He has reconciled in the body of His flesh through death, to present you holy, and blameless, and above reproach in His sight—if indeed you continue in the faith, grounded and steadfast, and are not moved away from the hope of the gospel which you heard, which was preached to every creature under heaven, of which I, Paul, became a minister” (Colossians 1:21-23). The enemies of the Roman Empire would sometimes place sharp, spiked objects on the ground in front of them before a battle. Any attacking soldier not wearing shoes substantial enough for the attack would soon find himself crippled or killed. Though the shoes were not by any means the most well-known part of the soldier’s armor, they were vital. The same is true where the armor of God is concerned. There is a famous quote of unknown origin that goes as follows: “If you’re going to talk the talk, you also have to walk the walk.” How are your feet prepared for the walk? A Christian wearing the armor of God will have his or her feet prepared and shod in the gospel of peace! Read more about the good news of the promised wonderful time of peace in our free booklet The Mystery of the Kingdom.